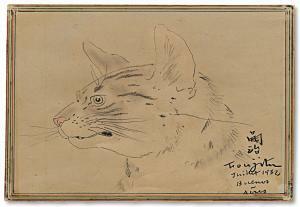 Find artworks, auction results, sale prices and pictures of Tsuguharu Léonard Foujita at auctions worldwide. 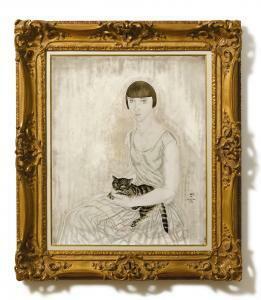 FEMME AU CHAT, PORTRAIT DE GHITA Léonard Tsuguharu Foujita 1886-1968 Galerie Paul Vallotton label affixed to the stretcher on the reverse signed in Japanese and English, dated 1926; signed in Japanese and English, dated 1926 on the reverse oil on canvas 72.8 by 60 cm; 28⅝ by 23⅝in. This work is accompanied by a certificate of authenticity issued by Tokyo Art Club Galerie Paul Vallotton, Lausanne Bollag, Zurich, November 11 1933, Lot 29 Private Japanese Collection PrivateAsian Collection Acquired directly from the above by the present important privateAsian collector in 1989-1990 Literature Sylvie & Dominique Buisson,Léonard Tsuguharu Foujita Vol. I,ACR Edition, Paris, 1987, plate 26.47, p. 386 In 1917, Tsuguharu Foujita moved to Paris from Japan. He fully immersed himself in the prevailing style of Western paintings at that time, and began to experiment with and explore the classical subject matter of female portraits. However, as he studied, he remained deeply attached to Japanese culture, and as a result created his own unique Eclecticism style - a style that illustrates classic themes found in Western paintings while retaining expression that is core to Eastern aesthetics. Femme au chat, portrait de Ghita (Lot 1011) was created in 1926, during a time when Foujita\’s stylistic approach towards female portraits was gradually becoming more consistent. Ghita, the lady in the portrait, sits confidently and firmly at centre, eyes opened and staring ahead; her soft, smooth and compact bob hair style, a sought-after cut in the early ninety twenties, presents the free-spirited and avant-garde look of city girls. Her skin exhibits smoothness and flawlessness, as if shaped from white jade, representing the perfect sensory aspects of beauty. Donning a plain and minimalistic dress, she appears pure with a hint of elegance; a cat rests on her lap, snoozing, an object of affection. Although Foujita has revisited similar subject matter multiple times, and has painted countless female sitters, each painting is filled with creativity, leaving a different sensory experience on every single occasion. In his own words: \“My models aren\’t only models for the sake of being a figurative matter in my work, they are here to feed me, and hence I go to my fullest extent to feed my soul with their nutrition… I nourish myself with their presence and nutrition even during my breaks in order to generate new concepts.\” The composition of the painting was inspired by traditional Ukiyo-e -- the use of delicate and fine black outlines leaves a smooth and pure surface that gives this oil painting a tasteful subtle beauty, unique to works created by watercolour. 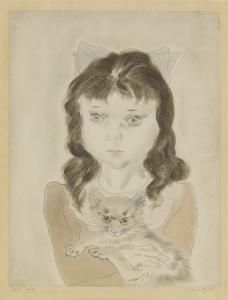 Foujita translates the use of monotone exquisitely by choosing a dominant milky white tone in the painting. From the lady\’s toned and lean arms, to her wrinkly dress and background canvas, Foujita skillfully adds grey rendering in the details, masterfully controlling lighting and shadowing effects through the use of color shading. The result is a sense that the character is floating in medieval elegance. Although running solo as the only Japanese in the School of Paris, Foujita has imbued Oriental aesthetics into the Western art world with his creative artistic concepts and an artful and unconditional perseverance. TSUGUHARU FOUJITA Fillette au Chat. Color etching on chine collé, 1929. 340x260 mm; 13 1/2x10 1/4 inches, full margins. Artist's proof. 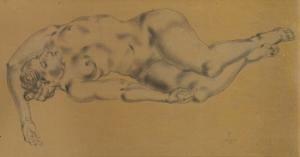 Signed and inscribed "H.C. 4/5" in pencil, lower margin. Published by Éditions artistiques Apollo, Paris. From Les Enfants. 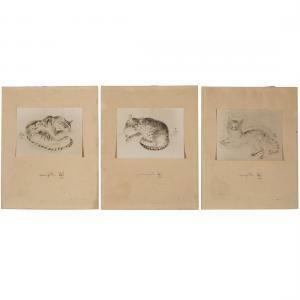 A very good impression of this scarce print. Buisson 29.66.